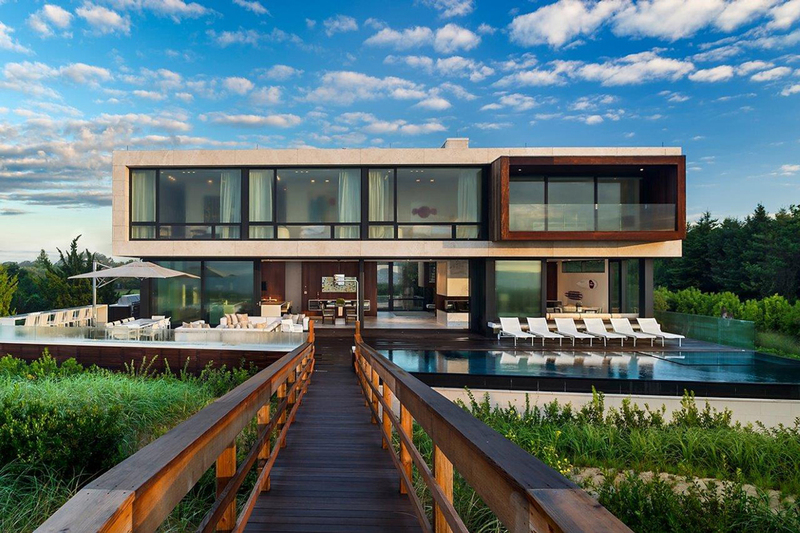 It was a decision that proved to be life-changing for Makoid, whose luxuriously modern homes now decorate much of the Hamptons as well as Western regions such as Lake Tahoe and Jackson Hole. 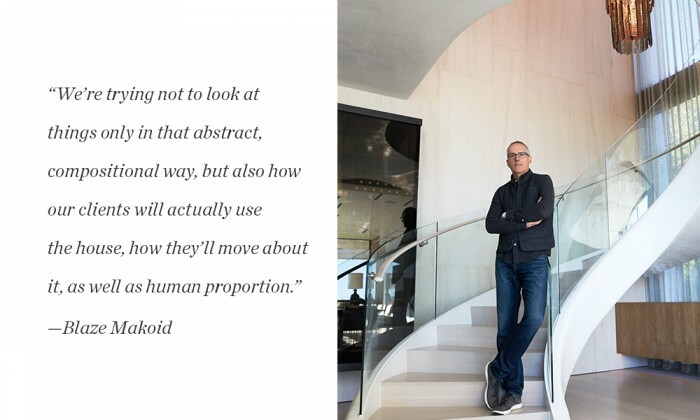 After graduating from the Rhode Island School of Design, Makoid began his architecture career on residential projects in Boston before becoming design director for largely commercial firms in Philadelphia. 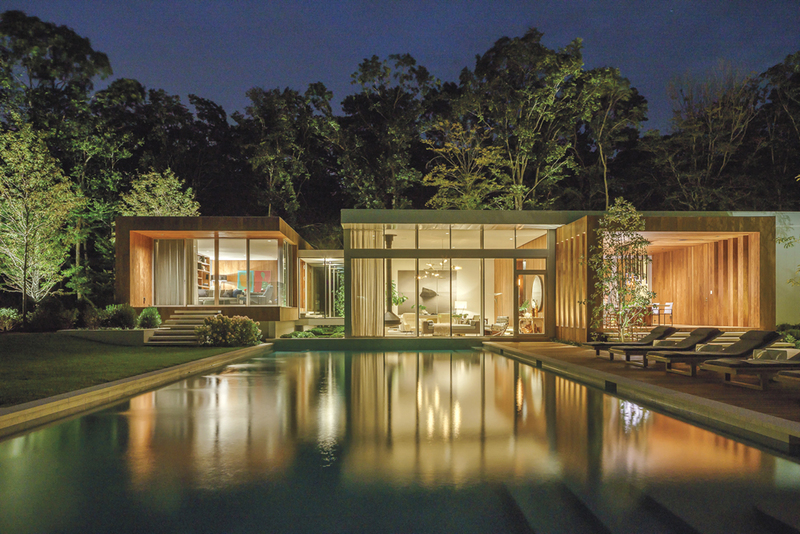 Makoid pivoted back toward luxury residential projects after moving to New York in 2001 and founding Blaze Makoid Architecture, where he and his team of 16 architects and designers creatively tailor every detail to the needs of their high-profile clients. Sculptural in form and bearing a signature balance of geometric lines and modern finesse, Makoid’s projects serve as indulgent escapes for clients. It’s a balance of deft composition and an unwavering attention to clients’ needs that have made the award-winning architect and his Bridgehampton-based firm—which boasts a second office in Lake Tahoe—so compelling. There seems to be both voyeuristic and intimate characteristics to your work. I think that there is an inherent tension between the desire to do a glass house and the idea of domesticity. A lot of times, when we’re designing a house that has the space to do it, if you can be in a part of the house and look across outdoor space to another part of the house, I find that really fascinating. I like the idea that the other part of the house seems like a middle ground so the outdoor space is the foreground and the horizon behind it is the background. Last fall, I visited Philip Johnson’s Glass House for the first time and read a bunch of essays from people who stayed in it and how there was that sort of uncomfortable thrill about being so exposed—it’s literally a glass box with no curtains, no shades and it’s disconcerting but in a really exciting way. How does natural light inform your designs? 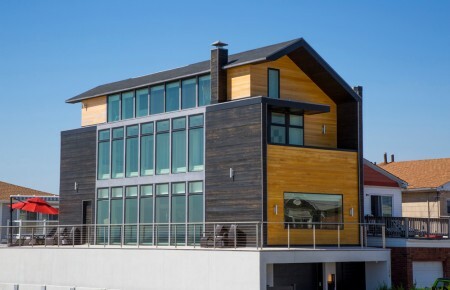 We attempt to bring in light in a smart, controlled way throughout the entire house—whether that’s through windows or skylights or screen openings or even just the form of the building. I would imagine that most, if not all of our houses, if they’re not open floor plan, they have a hallway that’s called a single-loaded hallway—one side of that hallway is exterior walls, so it has glass and gets light into it, the other half are the entries to different rooms. I’ve been to a lot of big houses in the past where hallways are what’s called double-loaded and there are rooms on both sides, like a hotel hallway. You have no real connection to daylight and I find that kind of depressing. We try to avoid that in the form of the house. There’s a rectangular motif in your designs. What draws you to that? What I’m trying to avoid is a house that’s like the cocktail napkin sketch that’s object-related and it becomes a one-liner and doesn’t have the layering of space that I think makes for a richer house. I also have this inherent feeling that other forms sometime tend to be the trend of the moment and we try to avoid being trendy because I think that inevitably leads to being dated. We’re trying to create houses that are as timeless as possible and the richness of the experience still being compositionally sophisticated. What guides you in choosing the relationship between windows and solid walls and how do you scale those decisions? Obviously we’re trying to put glass to maximize views and walls to create privacy. There’s this strategy of the internal looking out of this space, “where would we want to look out?” And then you’re sort of going back and forth between that and the design of the house where you’re looking more from the exterior in, trying to balance that interior need with a kind of proportional compositional need for the house so it looks cohesive. That just kind of goes back and forth and back and forth like a tennis match. You can’t do one without the other. There’s no real science to it, it’s kind of just a back-and-forth process. You use a lot of wood in your work. Are there certain types of wood you gravitate toward? We’re often trying as best as we can to bring our exterior materials into the interior of the house. Most exterior woods, if they’re not cedar, which is used a lot out here and has been used for generations, a lot of the woods are tropical hardwoods like teak mahogany and afromosia. From strictly an interiors standpoint, we use a lot of white oak and a lot of walnut. I find those to be softer, quieter kinds of wood—they’re not flashy, they’re more background material. These sort of handle daylight better, they’re not reflective. How do you incorporate the element of water? We look at water in two ways: is it part of the journey or part of the destination? One might be the sort of effect where you’re using water as a way to lead you somewhere and it’s part of the travel experience, it’s the journey. It might be a reflecting pool or a smaller body of water that is more linear, or it may be a tier of small pieces that take you from one step to the other. And then there are times when we use water more as the destination—whether it’s because the house is a waterfront property or there’s a pool that’s used as a gathering point for a summer home. 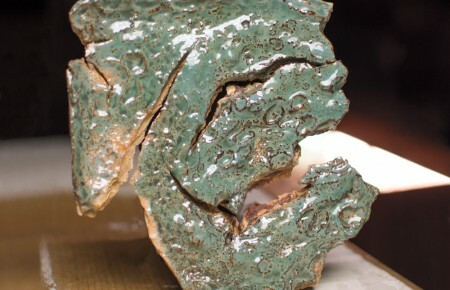 How do you create texture on flat surfaces? If there’s a surface that over the course of the day goes from being in shadow to being in daylight, that creates a visual texture. I also think about how we enjoy the slight imperfections of materials. If sunlight or artificial light grazes the surface, it’s accentuating the imperfections of that surface. What do you consider soft spaces and how do you use them? I think of soft spaces as sort of interstitial spaces. They’re either the space between rooms or they can act as sort of a glue in the plan or an area of relief where something can breathe. If we have a series of rooms that are more defined with walls and doors, it’s that combination of hallway horizontally and stairs vertically, something that these rooms all sort of glom onto.